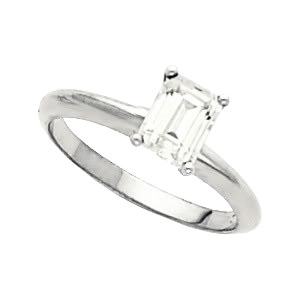 Find your dream ring in our large collection of emerald cut solitaire diamond engagement rings. This elegant cut will grab anyone's eye. The Emerald Cut Diamond has elegant long lines and intense flashes of light, this creates trim lines and an overall, sophisticated look. CaratsDirect2U offers GIA and EGL USA certificates on most of our emerald cut diamonds. Emerald cuts look great in solitaire settings. They also make a great second ring, and are very popular as a 55th (emerald) birthday present. Our collection of emerald cuts range from 0.5-1.00 carats in a large range of clarity and color, as well as naturally fancy yellow diamonds. For those looking for a nicer diamond at a lower price we also carry some emerald cut diamonds that have been through the K.M Treatment process. All of our diamond engagement rings are set in either white, yellow, or two tone 14k or 18k gold.